Some time ago, Bas van Dorp and I both decided we needed a Lemania 5100 watch. I bought a Sinn 142 St.S at Horloge Platform Nederland in The Hague and Bas ordered a Sinn EZM1. His one was on order, and since the run on the last watches with Lemania 5100 was enormous, he had to wait a bit longer. Last week his watch arrived and here you can read his review on his EZM1. watches make a statement on watch design. The Sinn has no subdials but it still has a two register chronograph. though we payed for them. A very bold statement. have a marker on 1 and 59 seconds because of the huge 12 hour marker. the legibility of the rest of the watch. Also a bold statement. 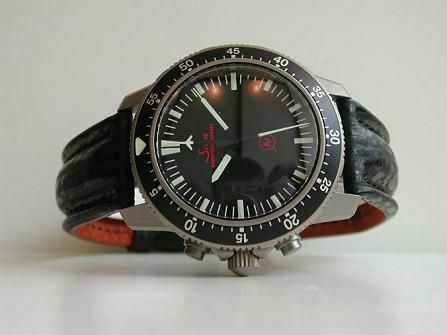 I do consider the Sinn EZM 1 a classic. Time will tell if I'm right. watch (I like long German words that just say it all). "that doesn't matter, it's not in production anymore."